An Easter candy bouquet is what you get when you combine the fun of an Easter gift basket with the beauty of a flower arrangement. Since I LOVE Easter baskets, this was a project I truly enjoyed and the kiddo I gave it to was ecstatic. 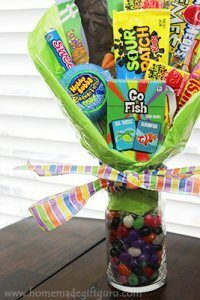 I love that this bouquet is playful... included is a game of Go Fish, lots of bright colored candy and I filled the vase with jelly beans (see how below). 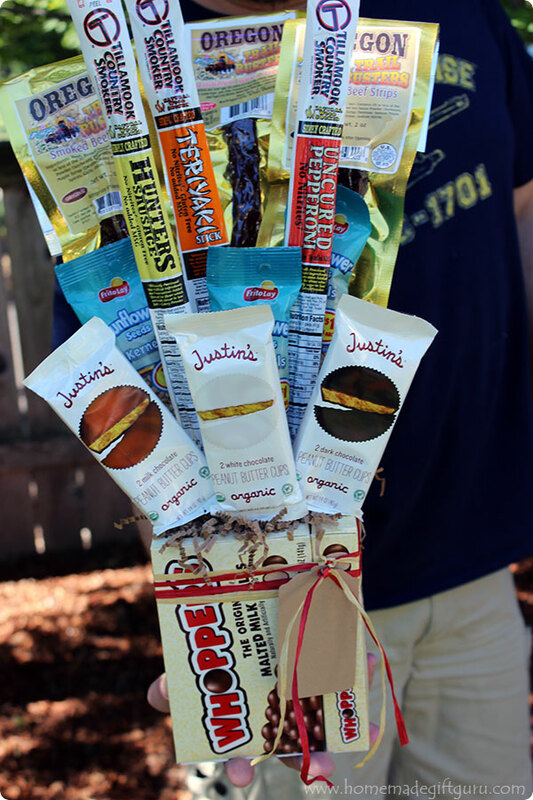 This Easter candy bouquet could easily be changed to a birthday candy bouquet, by swapping out the Easter Bunnny chocolate bar for something else. I'm thinking maybe a big bag of gummy worms, a small stuffed animal or a large chocolate bar. You can also find tutorials on how to make candy bouquets in various styles and containers, such as these cute little candy arrangements in pots, this small and super simple Valentine's Day candy bouquet and this set of three candy bouquets in cute and thrifty little re-purposed tin soup cans (an easy craft technique is used to make the tin cans beautiful). While each tutorial does have a different holiday theme, the theme isn't really important, since each idea can be easily altered to any theme you like. Type of Candy. 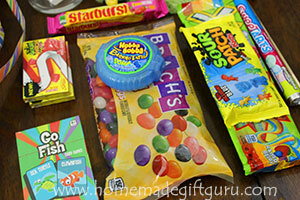 Choose candy that is colored and/or wrapped in the colors you need for the occasion. Homemade Wrappers. If you can't find candy in the color scheme you need, make your own candy bar wrappers using scrap book paper or gift wrap. Seasonal Candy. Take advantage of seasonal candy made special for the holiday or occasion at hand. Decorate. 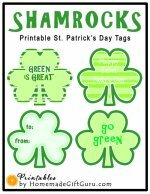 Decorate your bouquet with ribbon and gift tags (here's my free gift tags and free gift tag templates). Easter candy bouquets are the perfect homemade gift for anyone with a sweet tooth and the perfect project if you're looking for something easy, fun, creative and unique. Sound like an edible Easter craft you want to try? Great! Let's dive right in! 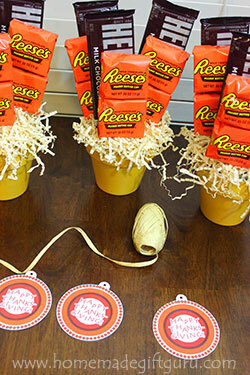 There are a ton of ways to make candy bouquets. For this project I used a clear glass vase, which was super fun because I was able to fill the vase with candy, as well as make the bouquet. Another awesome idea for a homemade Easter gift bouquet would be a potted candy arrangement like these ones, but with an Easter theme. Candy! 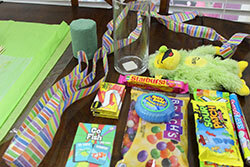 Easter is a great holiday for this project because there's lots of brightly colored candy to choose from. 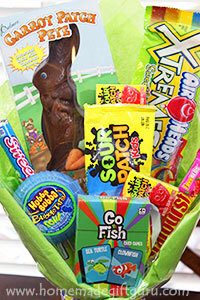 Pastels or rainbow are both really good options for Easter-themed candy bouquets. Don't forget a chocolate Easter bunny! Optional... it's optional but super fun to put in a special deck of playing cards, some bubbles, a stuffed animal, sidewalk chalk or something fun and non-edible. For this project I put in a deck of Go Fish. Glass Vase. I love the cylinder shape of the vase shown. It holds the floral foam nicely and has enough room to show off the jelly beans underneath. I find these vases at dollar stores and crafts stores. Floral Foam. You should be able to find floral foam cylinders 2 for $1 at dollar and craft stores. Ribbon. For tying around the vase. Tissue Paper. 3 pieces of square tissue paper that match the candy you choose. Cellophane. 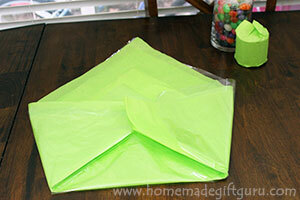 1 piece of cellophane cut to the same size as the tissue paper. Wooden Skewers. 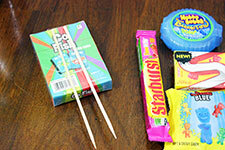 1 wooden skewer for each candy plus an extra for any candy that's heavy such as the chocolate bunny shown. Clear Cellophane Bag and Twist Tie. This is for the candy that goes inside the vase. Scissors or Jewelry Pliers. Something that can cut the wooden skewers. Non-Serrated Knife. May be needed to cut the floral foam. Step 1. Candy Inside the Vase. 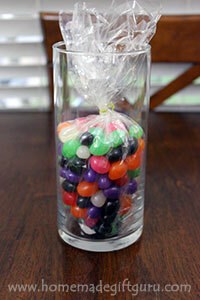 Put the cellophane bag inside the vase. Pour the jelly beans (or other candy) inside, taking care to leave plenty of room for the floral foam that will go above the candy. Make sure they are nicely packed in. Twist the top of the back and secure with a twist tie. Tips... If you buy loose candy, I recommend the cellophane bag technique. It will keep the candy fresh and clean. If you choose individually wrapped small candies such as tiny chocolate eggs, you can skip this bag and poor them directly into the container. Step 2. 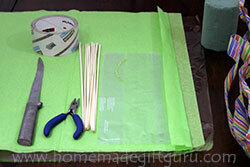 Wrap Floral Foam in Tissue Paper. If needed, you can cut some of the height from the floral foam. 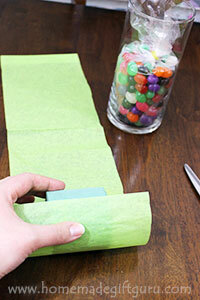 Then wrap the floral foam in a strip of tissue paper to keep your candy bouquet nice and clean. Step 3. Prepare the Tissue Paper Backdrop. This step is optional but I think it makes a nice back drop for your bouquet. Take your 2 pieces of tissue paper and the 1 piece of cellophane (all square, all same size) and turn them in a diamond position. Fold the bottom point up and the side points in. Adjust as needed. Roll this around the floral foam and put it all inside the vase. Tip... Again, while this step is optional, I find it creates a wonderful base and back drop for your candy bouquet. Step 4. Put Candy on Sticks. 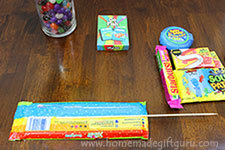 First, measure how high you want each piece of candy and trim the wooden skewers as needed. Always trim from the blunt side, as you will need the pointed side to puncture the floral foam. 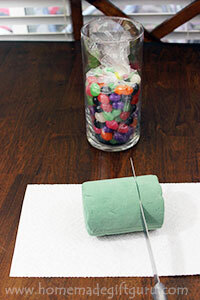 Use a large piece of clear packing tape to adhere each piece of candy to a wooden skewer. For heavier items like the deck of cards and the chocolate Easter bunny shown, you can use two skewers. Step 5. Arrange Candy. Stick the skewered packages of candy inside the floral foam. I like to start with the ones in the back and work my way forward. Step 6. Ribbon and Bow. Wrap your ribbon around the vase and make a bow if desired. 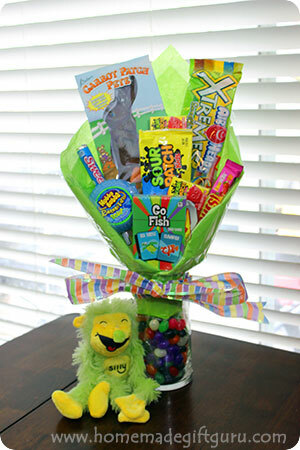 Or take your creative leave and decorate your Easter candy bouquet however you like! 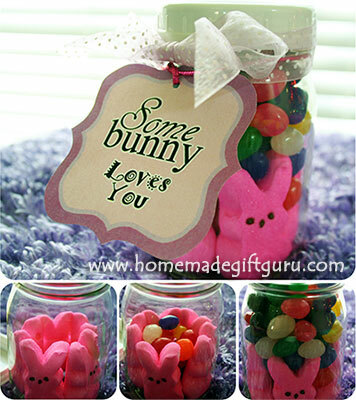 You can tie on an Easter gift tag like this "Somebunny Loves You" printable gift tag or make your own. I love making these sock bunnies to go with my Easter candy bouquets! 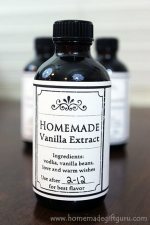 They also make wonderful additions to homemade Easter gift baskets. Looking for another unique Easter idea? These sock rabbits made with baby socks are super fun and unique... try putting them inside your Easter eggs for this year's Easter egg hunt! 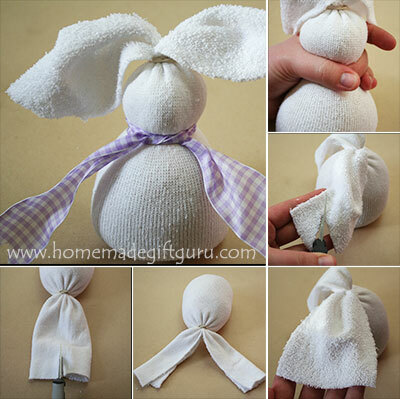 These no-sew sock bunnies are fun and EASY to make!